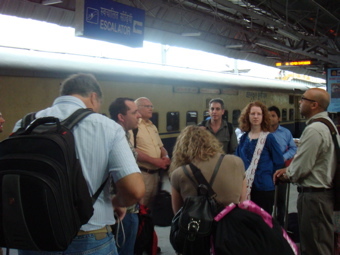 On Sunday at about 6:00 AM, we arrived at the Delhi Train Station. It reminded me of similar stations in Russia. Villagers coming in from the countryside, small time traders with bundles of goods, transients looking for a place to sleep, porters with large carts and vendors hawking provisions. In spite of the crowd, people were remarkably calm and well mannered, which was very different from what I had experienced in Moscow. In as much as it was possible, people didn’t seem to be pushing or cross. I heard few harsh words exchanged. Groups I didn’t notice were drunks and the type of predatory individuals who haunt inner-city stations hoping to make the best of the disorientation of travelers. Of course, unfamiliar with India, we didn’t really know what to look for and, by the time we took our seats, we had been relieved of a camera and a wallet. Although I didn’t know it at the time, I watched as the camera was stolen. As we entered our wagon, three non-descript men walking against the flow of passengers collided with the first member of our group (let’s call him professor X). They were indignant, accused Professor X of pushing (or so their tone suggested; my Hindi is still a bit rusty) as they shoved him into one row of seats. He tried to apologize and help them to get through, but they continued to reproach him for blocking their way. In the meantime, they spun him round and round, maneuvering him back and forth across the aisle. Another Wooster professor looked on, hoping to help the poor men through. How the wallet was extracted from a zipped handbag remains a matter of speculation.